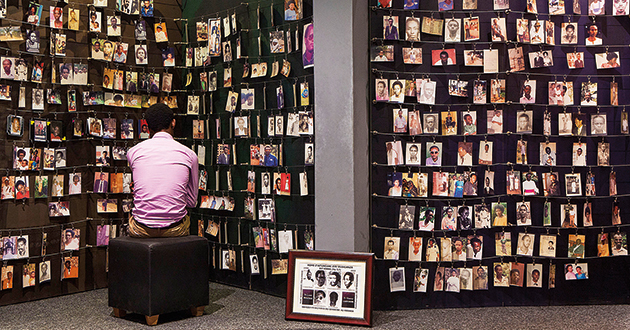 The Kigali Genocide Memorial in Rwanda serves as a place where people can remember their lost loved ones and as a museum where visitors can learn about the history, implementation and consequences of the genocide. Photo courtesy of the Kigali Genocide Memorial. Imagine that you’re standing on a site where a school was once under construction. That school building is now a museum, and beneath the ground lie the remains of more than 50,000 men, women and children — all victims of the 1994 Rwandan genocide. This is the Murambi Genocide Memorial Center in southern Rwanda, one of many sites visited by students in a unique study abroad program that focuses on genocide and its aftermath. In April 2019, Rwanda will observe the 25th anniversary of the 1994 genocide, which claimed the lives of as many as 1 million people in the span of about 100 days. “Genocides often fade into history; while people may know that violence occurred, less attention is paid to the aftermath,” said Hollie Nyseth Brehm, assistant professor of sociology and director of Ohio State’s genocide-focused study abroad program in Rwanda, which ran for the second time in summer 2018. For nearly a decade, Brehm has been chronicling the history of the Rwandan genocide, painstakingly analyzing data from nearly two million court trials and conducting countless interviews with both perpetrators and victims of the genocide. In Rwanda, tensions from recent colonial rule, an economic downturn, a civil war and a growing animosity between the nation’s two main ethnic groups — the Hutus and the Tutsis — preceded the genocide. She has spent many months in Rwanda working with the Rwandan National Commission for the Fight Against Genocide and is currently studying how convicted genocide perpetrators are reintegrated back into the community. This research could be vital to the future stability of Rwanda, as more than 30,000 of the nation’s 12.3 million citizens are presently serving sentences for genocide-related crimes. As a professor at Ohio State, Brehm teaches classes on global crime, violence, terrorism and, most recently, the study abroad course "Genocide and Its Aftermath in Rwanda." 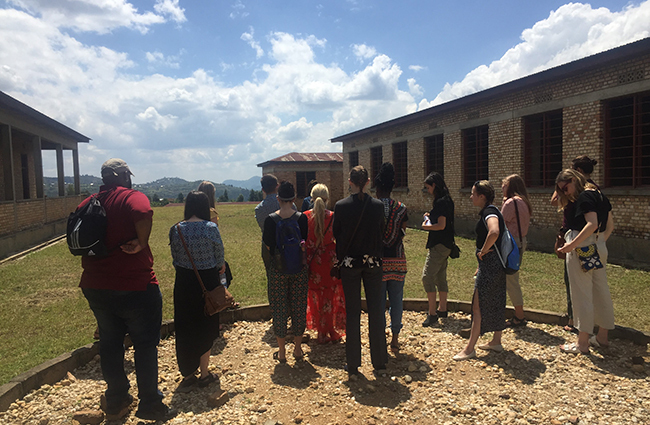 Students in Ohio State’s “Genocide and its Aftermath in Rwanda” study abroad program stand at the Murambi Genocide Memorial Center, which sits atop the buried remains of more than 50,000 victims of the 1994 Rwandan genocide. During the program’s inaugural run in 2017, 13 students accompanied Brehm to Rwanda to study genocide firsthand, meeting those whose family members were victims and the many people committed to moving the country forward. Over three weeks, students met with rescuers, victims and perpetrators who committed atrocities. They visited places filled with sorrow, and many filled with hope. They witnessed loss, change and renewal. “It’s so important for students to know that genocide continues to happen, and understanding why is the first step to preventing it from taking place,” Brehm said. Each student lived with a separate host family for a week and participated in the daily routines of Rwandans living in a country experiencing rapid economic growth and a digital revolution. As a teacher, Brehm wanted to create life-changing experiences for her students. As a sociologist, what she wanted most was for students to broaden their understanding of the world and question the familiar. For Gregory, talking with perpetrators of the genocide, as well as those who were victimized, opened his eyes to a more nuanced explanation of what took place in Rwanda. There are many reasons why someone would participate in genocide, said Brehm, noting fear, discriminatory attitudes against a targeted group, pressures from social networks and economic gains (like looting houses), among others. Jamie Wise, an undergraduate student from Wentzville, Missouri, was already working with Brehm on a research project on Rwanda before she joined the study abroad group. As a double major in sociology and international studies with minors in world politics and Arabic, Wise is deeply aware of and interested in global conflict. When Brehm and her students returned to the U.S., they met for a post-trip analysis and debrief. Lots of memories and photos were shared, and one recurring theme emerged — their lives were changed. And they have a stake in creating a more peaceful future. “Each of us has a responsibility to make the world a better place, where we are now, in whatever capacity we can,” Gregory said.